These are two photos of a car like the one I am working on ay present. I hope mine turns out as good. By the way, I need a battery box like the one shown on the running board if anyone can help. That is a great looking car. Is it also a high radiator car? On the USA cars if they have the original fenders with the fold over lip and splash apron below the radiator, it is very easy to tell it is a high radiator rather than a low radiator car. That helps a lot in looking at old photos of relatively new USA and even Canadian Ts. Once they get to be old or restored they can wind up with any combination of front fenders in a photo. For example my 1915 Blackie has the 1924 style front fenders with the lip. Clearly it didn’t come from the factory that way. 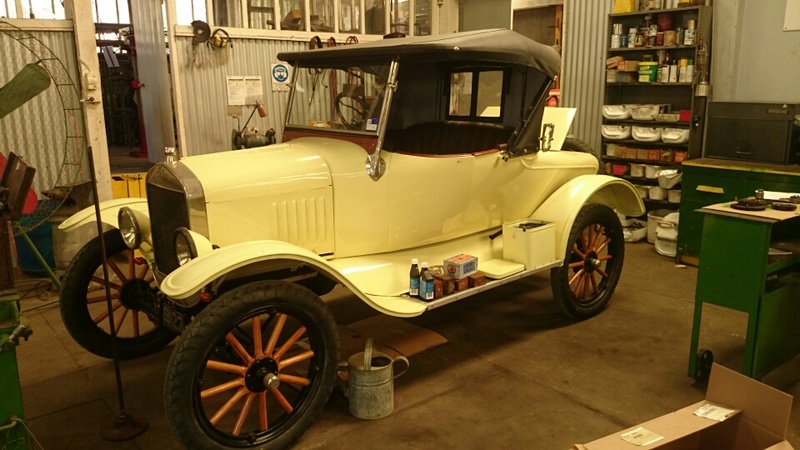 But with the Australian cars I haven’t found an easy way to see the difference between a low radiator 1919-1923 and a high radiator 1924-25. The Geelong 1925 is rather easy to spot but a 1925 Duncan and Fraser verses a 1922 Duncan and Fraser I haven’t seen enough pictures etc. for me to be able to easily tell which is the earlier low radiator and which is the later high radiator. Is that the car your brother was speaking about? And if so, are there any early photos when it was new that would answer all kinds of questions about the wide bodied deluxe bodies? Or photos before and/or during restoration? Or does the owner know what was changed during the restoration because something was missing or a replacement could not be found? 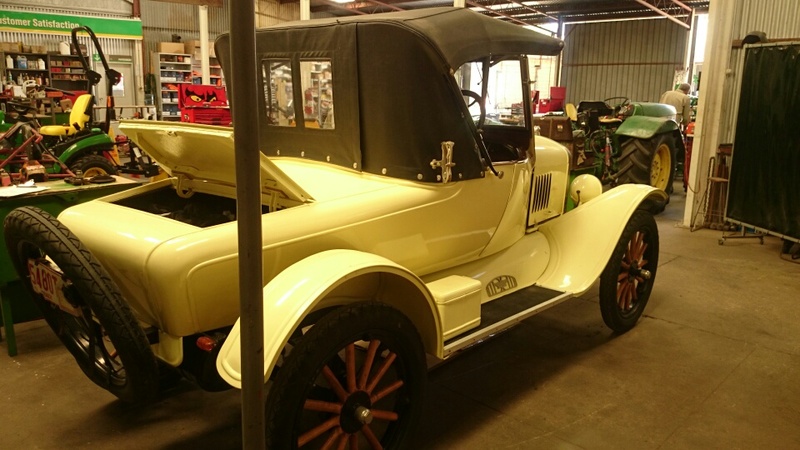 I’m hoping we can add an Australian section to the Model T Encyclopedia someday. For help in locating a similar battery box, please let us know the approximate dimensions. Lang’s has an accessory battery box at: https://www.modeltford.com/item/5158F.aspx It measures 8 inches high x 7 1/4 inches wide and 9 inches long. But it has square corners rather than the rounded ones. Is that the approximate size you are looking for but you would want one with the rounded corners on the sides and sides of the lid? I believe there are several folks that have posted photos of the battery boxes in the past. And depending on how much trouble you wanted to go to, I’m sure a good sheet metal shop could produce you a new replica any size you wanted. And if you had the patience you could construct some wood forms and learn to build one yourself. The first one would take way too much time and effort to make it economically practical to reproduce them that way. But learning a new skill gives a feeling of accomplishment. Again we always appreciate any information you can post or send concerning the Ts. Hap, it is a high radiator car. The lipped type front fenders are the same here as in the US. The low radiator D&F cars have cast brass windscreen pillars and frameless glass, as in David's photo of the original car in my previous post. I hope to get to see the car in the photos soon. It is the one my son Anthony found. It was restored by the current owner, so I should be able to get a good idea of how the car was before restoration. I just realised that car has the same box on each running board. Rather than a hinged-at-the-back lid, the lid is clipped on and is removed to get to the contents. Once I get my speedster back together, I hope to get into some serious work on my car.